From time to time we all need help summoning the courage to see the truth. Do you need to discover what is really being said? 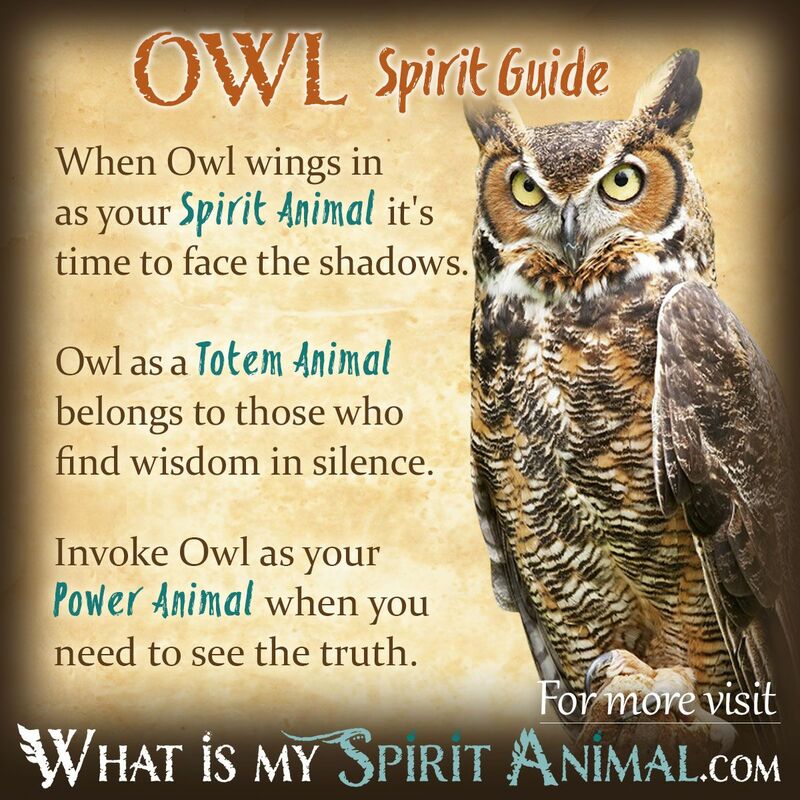 Owl as a Spirit, Totem, and Power Animal can help! Owl Spirit teaches you how to harness the strength needed to open your eyes and look into the shadows. Delve deeply in Owl symbolism and meaning to find out how this animal spirit guide can illuminate, assist, and educate you. Subscribe to our YouTube Channel, now! When you seek out Owl, it is a way of reaching your Higher Self and truly seeing things from a spiritual perspective; This refreshing vantage point allows you to open doorways into other realms and connect with the Devas, Ancestors, Angels, and the Divine. Owl has a strong connection with the element of air. Travel with Owl Spirit to the heavens and soar through the halls of the Akashic records. Owl will show you things that might otherwise remain hidden to you, so be open to seeing things in a whole new way. You cannot deceive Owl, which is why this Spirit Animal reminds us to remain true to ourselves, our voice and our vision. Owl does not tolerate illusion or secrets. If there are skeletons in the closet you can trust that Owl will find them and start house cleaning. It is no surprise that the Goddess Athena held Owls as sacred. Athena, is beyond doubt, one of the most complex Deities in history and her attributes included wisdom and strategy – so Owl spirit became the perfect companion. In Greek tradition Owl was also a protector. It was believed that an Owl flying over a soldier or army portended victory because Owl would remain watchful. As a creature of the night, the Celts and Egyptians regarded Owl as a gatekeeper to other realms, particularly the souls of the dead. In some stories this bird actually accompanies a soul so it doesn’t get lost on its journey. In Native American superstition Owl represents sacred knOwledge (you’ll get to know me, I live for puns). When you begin studying the mysteries this Spirit Animal Guide is an amazing helpmate and mentor. Overall Owl is a symbol of being able to navigate any darkness in our life. This spirit brings clarity, prophetic inklings, and a strong connection with the mystical world. When Owl wings its way into your life, you have the opportunity to become far more observant. Settle down on that tree limb and watch. You’ll be amazed at how much life goes by when you’re not running around so much. In fact, you’ll notice a lot of important details that previously eluded you. The world is filled with layers of symbolism and meaning, and the Owl gives you “new” eyes with which to see those. An Owl’s eyes adjust in an instant from telescopic to microscopic. With Owl energy surrounding your soul you can look into the past, present and future with uncanny accuracy. We aware that as a Spirit Animal, Owl often calls on us to release the past and put down burdens that hold us back. You have to face your shadows and fears, then move beyond them to find true happiness. Owls don’t just honor us with the ability of “Second Sight”. These majestic birds have hearing that is quite literally “perfect stereo”. Their ears are are not symmetrical as one is higher than the other. This allows sound to be heard separately in the individual ear. Owl as a Spirit Animal Guide can aid you in hearing what is really being said despite the words and emotions coming from the messenger. When you know Owl as a Totem Animal, you’ll find your connection with the Yin of the Universe growing stronger, as will your awareness of lunar cycles. Embrace the inner Goddess, weave your spells by the light of a full moon and really listen to your inner voice. Owl as a Totem Animal opens the doorway to seeing the spiritual beings inside the human bodies that house them. You will know things about people that are sometimes awkward or uncomfortable but you are seeing TRUE. Many people who have Owl totems discover their clairvoyance growing by leaps and bounds. The Owl totem is one of discernment. Let this Spirit guide you during confusing situations. Start trusting your spiritual radar about people and use the beauty of the night to inspire your creativity. Owl spirit has mastered silence and finds its strength there. With Owl as your Totem Animal you will not waste precious energy by speaking with no purpose. Remember, you have 2 eyes, 2 ears and 1 mouth. Seeing and hearing should occur 4 times more than speaking. In this, you’ll be able to glean wisdom others miss because they are too busy chattering their minds away. Invoke Owl as a Power Animal you are opening a doorway to hidden realms. In the quiet of the night you’ll find solace as the voice of the Divine becomes more clear. Owl flies quietly in our lives but always ask the question “WHO?” so be prepared for self-actualization when partnering with this spiritual being. Owl medicine can help support you when the time to speak your truth has arrived. Remember Owls are birds of prey and little stops them when they set their sites on “the prize”. What or whom do you have your heart set on? Focus, patience and stillness can win the day. Invoke Owl energy when you need to see all the details of what or who is coming toward you and is right in front of you. Native Americans refer to the Owl as a Night Eagle because of its keen vision. They regard the Owl as a conjuror who is silent and fierce, and who foretells the oncoming of death. The Owl is a harbinger of truth, particularly to self, and a creature that brings magic on its wings. In Celtic mythology, Owls knew the way to the underworld and were fierce defenders of truth and honor. Owl has no tolerance for deception, even when we are deceiving ourselves. The Celtic Owl was tied closely to the ancient Goddess of fertility. It appears frequently in knot work and bestiaries, being revered for its ability to see in the dark and acting as a messenger between humans and the Divine. Dreaming of Owls may be a warning from your higher self to be wary of a situation or person that is not as it appears. It may also be an omen of figurative or literal death, or hooting out a message from the Ancestors or dearly departed. Learn more about Owl Spirit by reading Owls in Dreams: Meaning, Symbolism, & Interpretation on WhatIsMySpiritAnimal.com! In Native American Zodiac & Astrology, people born May 21 – June 21 (Southern Hemisphere) & November 22 – December 21 (Northern Hemisphere) are born under the sign of the Owl. Owl people are extraordinary communicators, particularly when it comes to the great Mysteries. You have a quick mind, high standards and a strong sense of honor. Those with the Owl Native American Zodiac & Astrology Sign may be misunderstood because of their uncanny ability to move quietly and effectively through figurative or literal darkness. You are also fast on your feet, making it hard for people to keep up with you. Hi – reading the Owl page; it is helpful but may I make a humble suggestion? Might you consider referring to Native American tradition instead of superstition? Sent with an open heart and all humility. Everybody has their own reasons, but who says your right or wrong , and I am also speaking on myself as well. I may be right or wrong, but I do believe in many things. Just 1 thing to remember….. NEVER LOSE HOPE, FAITH,, and LOVE!! !